This is not exactly a policy triumph. The one sense in which Ireland has made some progress is that it has somewhat reassured bond investors that its population will continue to sullenly acquiesce in austerity; as a result, Irish 10-year rates, while still at a large premium, are now 60-80 basis points below those of Italy and Spain. But the repeated invocation of Ireland as a role model has gotten to be a sick joke. 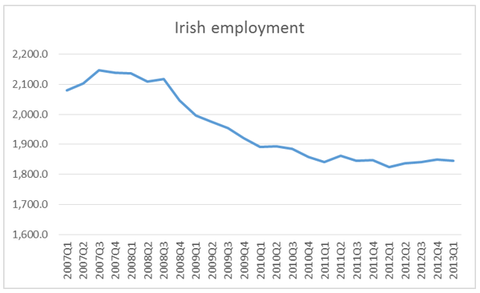 Kevin O’Rourke has a new paper on the Euro Crisis and the endemic mass unemployment in Ireland, Spain, Portugal, Greece, and Italy. I find it kind of remarkable that Ollie Rehn thinks this immiseration of millions of people is a “success.” It should also be noted that most of the decline in Ireland’s and Latvia’s unemployment rate is due to emmigration, particularly of young workers. I expect that emmigration and remittances will be the way Spain, Portugal, Italy, and Greece will also use to solve the Economic conundrum of remaining in the Euro and mass unemployment.